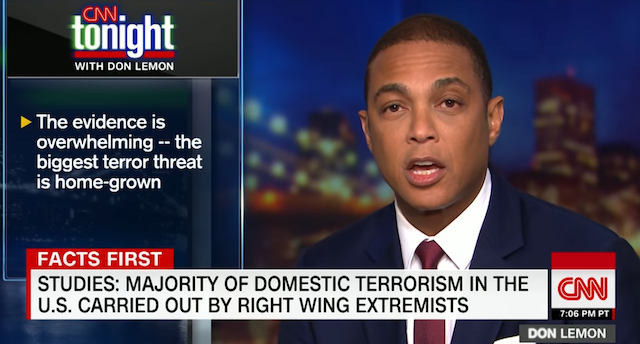 Instead of backing off, cooling the harsh divisive rhetoric, Don Lemon has doubled down demonizing and attacking white men as the biggest threat to America. You can take his rhetoric and swap it out with the attacks made against the police over the last couple years to see there’s really no difference. Why is this point being made? Because people need to realize this isn’t some typical off the wall statement we’ve come to expect from the unhinged left. When the left demonized the police it resulted in actual assassinations of cops. We’ve seen how the constant harping “You’ll lose your healthcare because of the republicans” resulted in an assassination attempt that left Steve Scalise severely wounded as the gunman said “this is for healthcare”. Talk about racism, lies and scare tactics, this guy epitomizes all of it as he attacks POTUS and millions of Americans. Lemon, CNN and their ilk on the left are fueling another Alexandria, but this time it will be some white guys standing around somewhere minding their business not even doing anything political. Don can pull any stat he wants, there’s always someone out there doing a study to produce the results you’re looking for. Shall we talk about the stats coming out of Chicago? It’s not white people doing all the killing there! Fact of the matter is democrats are violent. He is going to get people hurt, even killed because he IS putting a bullseye on the backs of all white men. WHEN a leftist attacks white men, Lemon should be held personally responsible, and let’s be honest if that does happen things are going to escalate badly where he won’t be safe! NO this site is NOT threatening him, but surely someone on the other side will be triggered to do something if white men are attacked because of his rhetoric. You see if Pittsburgh Synagogue attack is Trump’s fault then any white men being attacked is on Lemon – just using the rules the left has made clear. Leftists need to stop telling the right to tone things down. We aren’t the ones going on tv making outrageous racist statements, nor are we the ones attacking someone for wearing a hat or over their differing political beliefs.